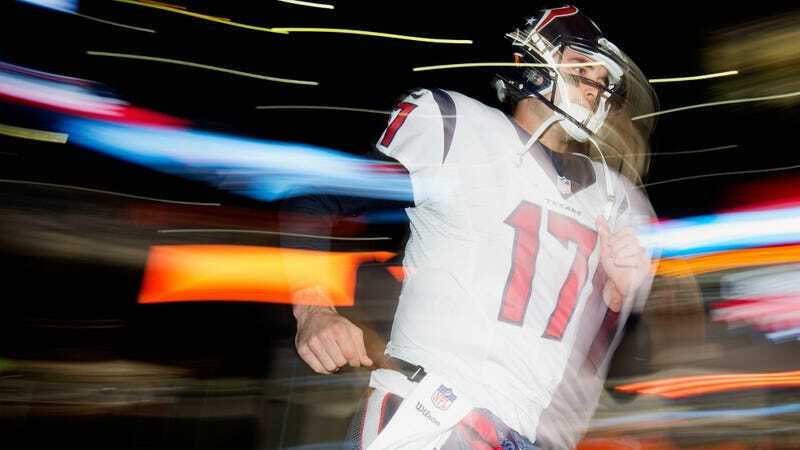 Who can say exactly when it became fun to track the movements of Brock Osweiler, the former trumped-up backup to Peyton Manning who signed a lucrative four-year deal with the Texans and has been spiraling his way back to Denver in the, umm, year since. It’s incredible to think that Osweiler’s $37 million guaranteed contract in Houston was signed as recently as March 2016. In just the 18 months since, Osweiler set a Texans franchise record for interceptions in a season, and ultimately flamed out so badly that Houston dumped a draft pick just to get off his salary. The Browns, happy to have the pick swap that brought them an additional second-round pick in the 2018 draft, will pay $15.225 million of Osweiler’s $16 million 2017 salary, even though he will be wearing the uniform of the Broncos. Perhaps no player in recent memory has seen his game-day value sink so swiftly without some sort of corresponding catastrophic injury or disastrous legal trouble. Osweiler, it seems, is just really, really bad. “I’m sure it’s been a tough one for him,” Elway said. “I know we thought a lot of Brock. He went 5-2 as a starter for us, and without Brock that year, we don’t win a Super Bowl. It’s not clear that the Broncos have any long-term plans for Osweiler, with Elway unwilling to commit to keeping him on the roster once Lynch returns to health.